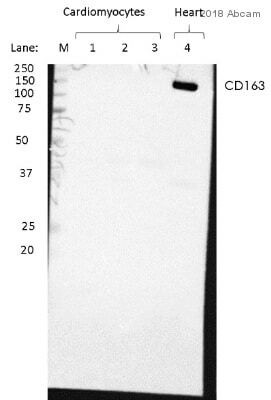 Rabbit recombinant monoclonal CD163 antibody [EPR19518]. Validated in WB, IHC, Flow Cyt and tested in Mouse, Rat, Human. Cited in 22 publication(s). Independently reviewed in 13 review(s). Recombinant fragment within Mouse CD163 aa 1-250. The exact sequence is proprietary. WB: Human fetal liver, fetal spleen and tonsil lysates; Mouse and rat liver, heart, spleen and thymus lysates. IHC-P: Human liver and placenta tissue. Mouse liver and spleen tissue. Rat liver tissues. IHC-Fr: Mouse spleen and liver tissues. Our Abpromise guarantee covers the use of ab182422 in the following tested applications. WB 1/1000. Detects a band of approximately 150 kDa (predicted molecular weight: 121 kDa). After shedding, the soluble form (sCD163) may play an anti-inflammatory role, and may be a valuable diagnostic parameter for monitoring macrophage activation in inflammatory conditions. Expressed in monocytes and mature macrophages such as Kupffer cells in the liver, red pulp macrophages in the spleen, cortical macrophages in the thymus, resident bone marrow macrophages and meningeal macrophages of the central nervous system. Expressed also in blood. Isoform 1 is the lowest abundant in the blood. Isoform 2 is the lowest abundant in the liver and the spleen. Isoform 3 is the predominant isoform detected in the blood. The SRCR domain 3 mediates calcium-sensitive interaction with hemoglobin/haptoglobin complexes. A soluble form (sCD163) is produced by proteolytic shedding which can be induced by lipopolysaccharide, phorbol ester and Fc region of immunoglobulin gamma. This cleavage is dependent on protein kinase C and tyrosine kinases and can be blocked by protease inhibitors. The shedding is inhibited by the tissue inhibitor of metalloproteinase TIMP3, and thus probably induced by membrane-bound metalloproteinases ADAMs. Secreted and Cell membrane. Isoform 1 and isoform 2 show a lower surface expression when expressed in cells. Immunohistochemical analysis of paraffin-embedded mouse spleen tissue labeling CD163 with ab182422 at 1/500 dilution, followed by Goat Anti-Rabbit IgG H&L (HRP) (ab97051) at 1/500 dilution. Cytoplasm staining on mouse spleen is observed. Counter stained with Hematoxylin. Secondary antibody only control: Used PBS instead of primary antibody, secondary antibody is ab97051 at 1/500 dilution. Immunohistochemical analysis of 4% paraformaldehyde-fixed, 0.2% Triton X-100 permeabilized frozen mouse spleen tissue labeling CD163 with ab182422 at 1/200 dilution, followed by Goat Anti-Rabbit IgG (Alexa Fluor® 488) (ab150077) secondary antibody at 1/1000 dilution (green). The result showed some cytoplasmic staining on mouse spleen. The nuclear counterstain is DAPI (blue). Secondary antibody only control: Used PBS instead of primary antibody, secondary antibody is ab150077 at 1/1000 dilution. Flow cytometry analysis of human PBMC cells (Human peripheral blood mononuclear cell) labeling with ab182422 at 1/60 dilution, 11.23 μg/ml (red). 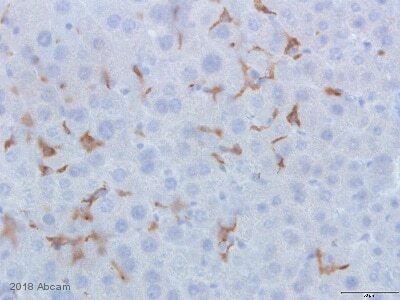 Goat anti rabbit IgG (Alexa Fluor® 488, ab150081) was used as the secondary antibody at 1/2000. Exposure time: Lane 1: 1 minute; Lane 2-5: 3 minutes. U937 , THP-1 and J774A.1 cell lines were reported to be negative for CD163 expression. (PMID:16368951, 10648003 & 10577520). The molecular weight observed is consistent with what has been described in the literature (PMID:9712057 & 16517975). 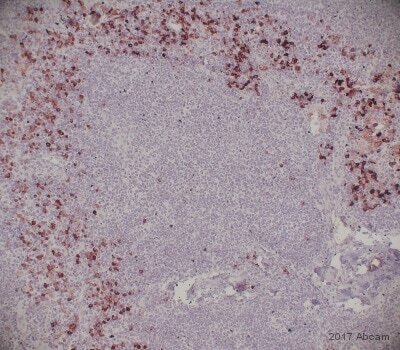 Immunohistochemical analysis of paraffin-embedded human liver tissue labeling CD163 with ab182422 at 1/500 dilution, followed by Goat Anti-Rabbit IgG H&L (HRP) (ab97051) at 1/500 dilution. Cytoplasm staining on Kupffer cells of human liver is observed. Counter stained with Hematoxylin. Secondary antibody only control: Used PBS instead of primary antibody, secondary antibody is ab97051 at 1/500 dilution. Immunohistochemical analysis of paraffin-embedded human placenta tissue labeling CD163 with ab182422 at 1/500 dilution, followed by Goat Anti-Rabbit IgG H&L (HRP) (ab97051) at 1/500 dilution. Cytoplasm staining on Hofbauer cells in human placenta is observed. Counter stained with Hematoxylin. 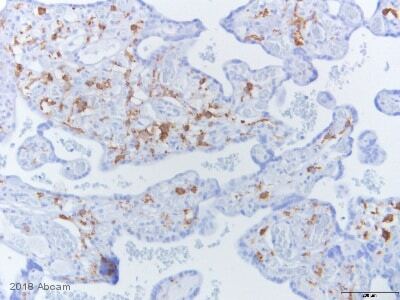 Secondary antibody only control: Used PBS instead of primary antibody, secondary antibody is ab97051 at 1/500 dilution. Immunohistochemical analysis of paraffin-embedded mouse liver tissue labeling CD163 with ab182422 at 1/500 dilution, followed by Goat Anti-Rabbit IgG H&L (HRP) (ab97051) at 1/500 dilution. Cytoplasm staining on Kupffer cells of mouse liver is observed. Counter stained with Hematoxylin. Secondary antibody only control: Used PBS instead of primary antibody, secondary antibody is ab97051 at 1/500 dilution. Immunohistochemical analysis of paraffin-embedded rat liver tissue labeling CD163 with ab182422 at 1/500 dilution, followed by Goat Anti-Rabbit IgG H&L (HRP) (ab97051) at 1/500 dilution. Cytoplasm staining on Kupffer cells of rat liver is observed. Counter stained with Hematoxylin. Secondary antibody only control: Used PBS instead of primary antibody, secondary antibody is ab97051 at 1/500 dilution. Immunohistochemical analysis of 4% paraformaldehyde-fixed, 0.2% Triton X-100 permeabilized frozen mouse liver tissue labeling CD163 with ab182422 at 1/200 dilution, followed by Goat Anti-Rabbit IgG (Alexa Fluor® 488) (ab150077) secondary antibody at 1/1000 dilution (green). The result showed some cytoplasmic staining on mouse liver. The nuclear counterstain is DAPI (blue). Secondary antibody only control: Used PBS instead of primary antibody, secondary antibody is ab150077 at 1/1000 dilution. Publishing research using ab182422? Please let us know so that we can cite the reference in this datasheet.